The brilliant historian of the English people* has written of Washington, that “no nobler figure ever stood in the fore-front of a nation’s life.” In any book which undertakes to tell, no matter how slightly, the story of some of the heroic deeds of American history, that noble figre must always stand in the fore-front. But to sketch the life of Washington even in the barest outline is to write the history of the events which made the United States independent and gave birth to the American nation. Even to give alist of what he did, to name his battles and recount his acts as president, would be beyond the limit and the scope of this book. Yet it is always possible to recall the man and to consider what he was and what he meant for us and for mankind He is worthy the study and the remembrance of all men, and to Americans he is at once a great glory of their past and an inspiration and an assurance of their future. To understand Washington at all we must first strip off all the myths which have gathered about him. We must cast aside into the dust-heaps all the wretched inventions of the cherry-tree variety, which were fastened upon him nearly seventy years after his birth. We must look at him as he looked at life and the facts about him, without any illusion or deception, and no man in history can better stand such a scrutiny. Born of a distinguished family in the days when the American colonies were still ruled by an aristocracy, Washington started with all that good birth and tradition could give. Beyond this, however, he had little. His family was poor, his mother was left early a widow, and he was forced after a very limited education to go out into the world to fight for himself He had strong within him the adventurous spirit of his race. He became a surveyor, and in the pursuit of this profession plunged into the wilderness, where he soon grew to be an expert hunter and backwoodsman. Even as a boy the gravity of his character and his mental and physical vigor commended him to those about him, and responsibility and military command were put in his hands at an age when most young men are just leaving college. As the times grew threatening on the frontier, he was sent on a perilous mission to the Indians, in which, after passing through many hardships and dangers, he achieved success. When the troubles came with France it was by the soldiers under his command that the first shots were fired in the war which was to determine whether the North American continent should be French or English. In his earliest expedition he was defeated by the enemy. Later he was with Braddock, and it was he who tried, to rally the broken English army on the stricken field near Fort Duquesne. On that day of surprise and slaughter he displayed not only cool courage but the reckless daring which was one of his chief characteristics. He so exposed himself that bullets passed through his coat and hat, and the Indians and the French who tried to bring him down thought he bore a charmed life. He afterwards served with distinction all through the French war, and when peace came he went back to the estate which he had inherited from his brother, the most admired man in Virginia. It was from New England, far removed from his own State, that the demand came for his appointment as commander-in-chief of the American army. Silently he accepted the duty, and, leaving Philadelphia, took command of the army at Cambridge. There is no need to trace him through the events that followed. 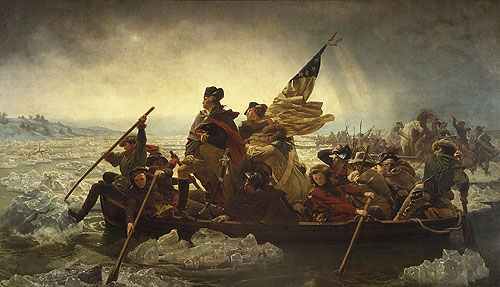 From the time when he drew his sword under the famous elm tree, he was the embodiment of the American Revolution, and without him that revolution would have failed almost at the start. How he carried it to victory through defeat and trial and every possible obstacle is known to all men. Mr. President:–The great events on which my resignation depended having at length taken place, I have now the honor of offering my sincere congratulations to Congress, and of presenting myself before them, to surrender into their hands the trust committed to me and to claim the indulgence of retiring from the service of my country. Happy in the confirmation of our independence and sovereignity and pleased with the opportunity afforded the United States of becoming a respectable nation, I resign with satisfaction the appointment I accepted with diffidence; a diffidence in my abilities to accomplish so arduous a task, which, however, was superseded by a confidence in the rectitude of our cause, the support of the supreme power of the Union, and the patronage of Heaven. While I repeat my obligations to the Army in general, I should do injustice to my own feelings not to acknowledge, in this place, the peculiar services and distinguished merits of the Gentlemen who have been attached to my person during the war. It was impossible that the choice of confidential officers to compose my family should have been more fortunate. Permit me, sir, to recommend in particular those who have continued in service to the present moment as worthy of the favorable notice and patronage of Congress. Washington did not refuse the dictatorship, or, rather, the opportunity to take control of the country, because he feared heavy responsibility, but solely because, as a high-minded and patriotic man, he did not believe in meeting the situation in that way. He was, moreover, entirely devoid of personal ambition, and had no vulgar longing for personal power. After resigning his commission he returned quietly to Mount Vernon, but he did not hold himself aloof from public affairs. On the contrary, he watched their course with the utmost anxiety. He saw the feeble Confederation breaking to pieces, and he soon realized that that form of government was an utter failure. In a time when no American statesman except Hamilton had yet freed himself from the local feelings of the colonial days, Washington was thoroughly national in all his views. Out of the thirteen jarring colonies he meant that a nation should come, and he saw–what no one else saw–the destiny of the country to the westward. He wished a nation founded which should cross the Alleghanies, and, holding the mouths of the Mississippi, take possession of all that vast and then unknown region. For these reasons he stood at the head of the national movement, and to him all men turned who desired a better union and sought to bring order out of chaos. With him Hamilton and Madison consulted in the preliminary stages which were to lead to the formation of a new system. It was his vast personal influence which made that movement a success, and when the convention to form a constitution met at Philadelphia, he presided over its deliberations, and it was his commanding will which, more than anything else, brought a constitution through difficulties and conflicting interests which more than once made any result seem well-nigh hopeless. When the Constitution formed at Philadelphia had been ratified by the States, all men turned to Washington to stand at the head of the new government. As he had borne the burden of the Revolution, so he now took up the task of bringing the government of the Constitution into existence. For eight years he served as president. He came into office with a paper constitution, the heir of a bankrupt, broken-down confederation. He left the United States, when he went out of office, an effective and vigorous government. When he was inaugurated, we had nothing but the clauses of the Constitution as agreed to by the Convention. When he laid down the presidency, we had an organized government, an established revenue, a funded debt, a high credit, an efficient system of banking, a strong judiciary, and an army. We had a vigorous and well-defined foreign policy; we had recovered the western posts, which, in the hands of the British, had fettered our march to the west; and we had proved our power to maintain order at home, to repress insurrection, to collect the national taxes, and to enforce the laws made by Congress. Thus Washington had shown that rare combination of the leader who could first destroy by revolution, and who, having led his country through a great civil war, was then able to build up a new and lasting fabric upon the ruins of a system which had been overthrown. At the close of his official service he returned again to Mount Vernon, and, after a few years of quiet retirement, died just as the century in which he had played so great a part was closing. 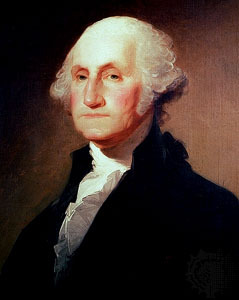 Washington stands among the greatest men of human history, and those in the same rank with him are very few. Whether measured by what he did, or what he was, or by the effect of his work upon the history of mankind, in every aspect he is entitled to the place he holds among the greatest of his race. Few men in all time have such a record of achievement. Still fewer can show at the end of a career so crowded with high deeds and memorable victories a life so free from spot, a character so unselfish and so pure, a fame so void of doubtful points demanding either defense or explanation. Eulogy of such a life is needless, but it is always important to recall and to freshly remember just what manner of man he was. In the first place he was physically a striking figure. He was very tall, powerfully made, with a strong, handsome face. He was remarkably muscular and powerful. As a boy he was a leader in all outdoor sports. No one could fling the bar further than he, and no one could ride more difficult horses. As a young man he became a woodsman and hunter. Day after day he could tramp through the wilderness with his gun and his surveyor’s chain, and then sleep at night beneath the stars. He feared no exposure or fatigue, and outdid the hardiest backwoodsman in following a winter trail and swimming icy streams. This habit of vigorous bodily exercise he carried through life. Whenever he was at Mount Vernon he gave a large part of his time to fox-hunting, riding after his hounds through the most difficult country. His physical power and endurance counted for much in his success when he commanded his army, and when the heavy anxieties of general and president weighed upon his mind and heart. He was an educated, but not a learned man. He read well and remembered what he read, but his life was, from the beginning, a life of action, and the world of men was his school. He was not a military genius like Hannibal, or Caesar, or Napoleon, of which the world has had only three or four examples. But he was a great soldier of the type which the English race has produced, like Marlborough and Cromwell, Wellington, Grant, and Lee. He was patient under defeat, capable of large combinations, a stubborn and often reckless fighter, a winner of battles, but much more, a conclusive winner in a long war of varying fortunes. He was, in addition, what very few great soldiers or commanders have ever been, a great constitutional statesman, able to lead a people along the paths of free government without undertaking himself to play the part of the strong man, the usurper, or the savior of society. He was a very silent man. Of no man of equal importance in the world’s history have we so few sayings of a personal kind. He was ready enough to talk or to write about the public duties which he had in hand, but he hardly ever talked of himself. Yet there can be no greater error than to suppose Washington cold and unfeeling, because of his silence and reserve. He was by nature a man of strong desires and stormy passions. Now and again he would break out, even as late as the presidency, into a gust of anger that would sweep everything before it. He was always reckless of personal danger, and had a fierce fighting spirit which nothing could check when it was once unchained. But as a rule these fiery impulses and strong passions were under the absolute control of an iron will, and they never clouded his judgment or warped his keen sense of justice. But if he was not of a cold nature, still less was he hard or unfeeling. His pity always went out to the poor, the oppressed, or the unhappy, and he was all that was kind and gentle to those immediately about him. We have to look carefully into his life to learn all these things, for the world saw only a silent, reserved man, of courteous and serious manner, who seemed to stand alone and apart, and who impressed every one who came near him with a sense of awe and reverence. One quality he had which was, perhaps, more characteristic of the man and his greatness than any other. This was his perfect veracity of mind. He was, of course, the soul of truth and honor, but he was even more than that. He never deceived himself He always looked facts squarely in the face and dealt with them as such, dreaming no dreams, cherishing no delusions, asking no impossibilities,–just to others as to himself, and thus winning alike in war and in peace.